(May 10, 2011) Much has been written on the downstream impact of China’s dams on the Lancang-Mekong River, which flows through or along the borders of five other countries after exiting China. Most of the discussion relates to the hydrological impact of impounding water in the eight dams along the mainstream Lancang Jiang in Yunnan Province. Particular concern surrounds the recently completed Xiaowan Dam and the recently approved construction of the Nuozhadu Dam, each of which is of a scale to impound quantities of water that can affect river hydrology throughout the basin. The Lancang Cascade, as it is termed, has caused considerable controversy in downstream countries, most notably during the 2008 floods and the 2010 drought. Both the floods and the droughts were blamed by many in Thailand, and some in Laos, Cambodia and Vietnam, on China’s actions. Recent articles on the downstream implications of altered river hydrology and the need for China to be less disingenuous in its public relations over the issue show the confluence of river hydrology and geopolitics in an international river basin such as the Lancang-Mekong. The Lancang Dams have major implications for downstream hydrology, with the potential to exacerbate or ameliorate both floods and droughts and to impact on fisheries and other bases for the livelihoods of downstream users of the river. Cumulatively, they have the potential to increase dry season flows by 30 to 50 per cent in the reach of the Mekong River above the Lao capital Vientiane. However, there are also more indirect implications of the Lancang dams that receive less attention despite having a bearing on highly controversial current projects such as the proposed Xayabouri Dam in Laos. Currently there are proposals for up to 11 dams on the lower Mekong mainstream, meaning the section of the river below China. These dams include sections of the river bordering or inside three of the four countries that are member states of the Mekong River Commission (MRC). Dams have been planned for the Lower Mekong since the 1950s, but the Cold War put development on hold in the 1960s through to the 1980s. By the time mainstream dams came back onto the agenda in the early 1990s, environmental concerns over large dams had grown to the extent that the dusting off of these megaprojects designed a generation earlier was simply unpalatable, and it was mostly assumed until recently that mainstream dams were off the agenda. Several factors help explain the revival of Mekong mainstream dams, and China is implicated in a number of ways. One way in which China’s own development of the river drives the logic of building more dams further downstream is simply the demonstration and equity effect: the Lao government in particular sees no reason why it should hold back on developing a shared river when an upstream country is already doing so. There is a tension in the position of Laos in this regard, since unlike China the country is a member of MRC and needs to temper expressions of sovereignty over the river within its own borders with an adherence to procedures for prior consultation agreed to for projects with potential transboundary impacts. A more material way in which China’s Lancang dams have helped bring the lower mainstream dams back into the decision making arena is through the changed hydrology of the Mekong River. Particularly in its upper reaches immediately below the Lancang dams, the altered flood hydrology makes the economics of dams on the lower mainstream more favourable than before. Early versions of the lower mainstream dams included large storages, for example at the giant Pa Mong dam proposed during the 1960s. However, the scaled-down versions are commonly referred to as “run-of-river” dams, dependent on the seasonal flow of the river to generate power without being able to store more than a few days’ flow at most. Without upstream storages, such dams would only operate at their full power capacity for a few months each year. With an evened-out flow from the Lancang dams however, with more water available during the dry season and less during the wet season, the prospects for year-round power generation are greater than under an unregulated monsoonal flood regime. A further role that China has in development of dams downstream is the investment by Chinese state-owned power corporations in several of the key projects. Until the 1990s, most dams in the lower Mekong countries were public investments, based on loans from the World Bank and Asian Development Bank. The game has changed, and most dams are now commercial projects. China has weighed in heavily amongst these investments, with estimates that up to 40 per cent of the proposed tributary and mainstream hydropower development in coming years in MRC member countries – i.e. outside China – will be done by Chinese companies. These projects include four of the eleven proposed mainstream dams, at Pak Beng, Pak Lay and Xanakham in Laos and at Sambor in Cambodia. Thai, Vietnamese and Malaysian companies have been granted concessions to build the remaining mainstream projects, indicating that the geopolitics of dam construction is now further complicated by commercial interests within the region. One of the implications is that the politics of dams with transboundary impacts are internal to national spaces as well as transboundary in scope. For example as Vietnamese companies wishing to build the Luang Prabang and Stung Treng Dams in Laos and Cambodia respectively cut across the concerns of those in the Mekong Delta, there are concerns that the mainstream dams in upstream countries will capture silt and ruin fisheries, with enormous consequences for the 20 million Vietnamese living in the Delta. Recent concern over Chinese image abroad has led to some interesting changes in the way it conducts its hydro-business. At the MRC Summit in Hua Hin in April 2010, China agreed to release more data on inflows and outflows from its cascade of dams on the Lancang Jiang. This came in the wake of disquiet in downstream countries over the possible impacts of reservoir filling and releases on low flows and flash floods respectively. While China’s sharing of data still falls far short of full disclosure, the move did reveal awareness of the need to cooperate with downstream countries. Also, Sino-Hydro and other companies have been taking environmental impact assessment more seriously than in the past. Sino-Hydro’s Nam Ngum 5 tributary dam is one that is being used as a test case in the new Hydropower Sustainability Assessment Protocol that has been developed by the international hydropower industry in dialogue with some NGOs and other partners (link[PDF]). A further development related to China’s role as the upstream player in the Mekong is a shift in regional geopolitics with the re-entry of the United States into the region through its Lower Mekong Initiative. While the US has yet to decide what material developments will take place under this program, the Initiative has been announced with thinly veiled attempts to trump Chinese influence in the region, sometimes portraying the US as a downstream friend to counterbalance the upstream environmental foe. The US has taken the part of ASEAN against China in higher profile instances, notably in its statements on the South China Sea at the July 2010 ASEAN Regional Forum (link). 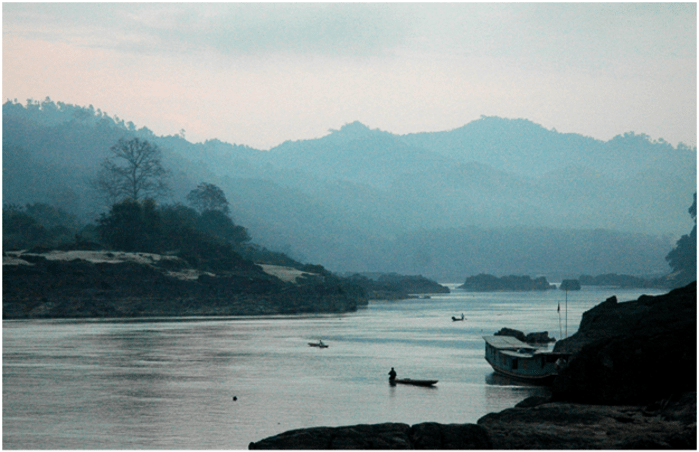 What do these seemingly disparate indirect aspects of China’s role in Mekong mainstream hydropower beyond the Lancang Cascade tell us about the region’s environmental politics and development trajectories? There are at least two ways in which they paint a more coherent picture than is immediately apparent. First, it is useful to understand the political logic of the mainstream dams in China and the lower Mekong in terms of path dependency, or the idea that events and their consequences are triggered and explicable in part by previous events and can go on to influence yet further developments in a cascading manner. That is, while the immediate considerations of the Lancang Cascade have been considered largely in their own right, there is a bigger and interconnected set of hydrological, economic and political implications of China’s development within its own territory that seems to be pushing inevitably toward construction of dams on the lower Mekong mainstream. In turn, this is driving a new geopolitics, both between China and the lower Mekong countries and also amongst and within the MRC members, as various players realign based on their position on the mainstream dams. Second, it is clear that the environmental politics around dams on the Lancang and lower Mekong mainstream are intricately bound up in a wider world of geopolitical relations. These include China’s emerging relations with regional neighbours. They also include the regional playing out of competition between older and newer world superpowers. What is notable is the way in which these geopolitics are now enmeshed in resource and environmental concerns over a shared river system. It would be dangerous to equate path dependency with fatalism over Mekong mainstream dams. Important decisions are yet to be made. It would equally be wrong to consider that environmental considerations are subject and subsidiary to dominant geopolitical concerns and that international relations rather than concern for a shared river system entirely rule the game. The recent publication by MRC of the Strategic Environmental Assessment (SEA) report on the lower Mekong mainstream dams, which recommends a ten year moratorium on the eleven projects, presents an opportunity for the countries of the region to move beyond the path dependency that sees one dam leading to another… and another, until the river becomes a cascade of still-water lakes – as would be the case for 60 per cent of the length of the lower mainstream if all eleven dams were to go ahead. A telling case is underway whose outcome will demonstrate whether or not the cooperative arrangement represented by MRC will take note of the SEA as the most comprehensive scientific assessment to date. The first of the mainstream dams, Xayabouri, was notified by Lao PDR for prior consultation by MRC member states over a six month period to April 2011. This is the first time that other MRC countries have been asked to give their opinions on a dam proposed in the territory of one of their neighbours. Xayabouri is a Thai project inside Laos, whose lead contractor is the Thai company Ch. Kanchang, whose financing would be mainly by Thai banks, and whose market for power is primarily in Thailand. On 19 April, the Joint Committee of MRC held a special meeting to decide what position to take on the dam. The outcome of the meeting was that the countries agreed to disagree, based on concerns expressed both in technical reviews of the dam proposals and a series of public consultations, at which strong opposition to Xayabouri and other mainstream dams was expressed. The matter was referred upward to the Ministerial Council level, effectively putting the dam in abeyance. At the time of writing (early May) the company proposing Xayaburi Dam is adamant that the project will go ahead, reassuring its shareholders that the deal is still on. The Lao government has sent mixed messages, initially insisting on its sovereign right to develop water resources on its own section of the river, but then indicating that it would commission an expert review of the Environmental Impact Assessment before proceeding. Meanwhile the Prime Ministers of Vietnam and Cambodia have made an unequivocal joint statement that the dam should go on hold, at least for the time being. The geopolitics involved for the first time put the country arguing for the right to develop, based on the principle of territorial sovereignty, on the back foot relative to downstream countries arguing from the basis of territorial integrity, or the need to respect the implications of upstream development for the well-being of people downstream – in the Mekong Delta and Tonle Sap lake area in particular. If a deal is done to go ahead with Xayaburi despite the SEA recommendations and despite the technical, community and riparian government concerns over the project, this will more than likely open the floodgates for further dams on the mainstream, at enormous cost to the well-being of the millions who depend on the river for their everyday livelihoods. Ultimately, this outcome is linked to China’s actions further upstream, without which it is highly unlikely that the mainstream dams would be under discussion as they are today. Philip Hirsch is Director, Australian Mekong Resource Centre, University of Sydney, He is the co-editor with C. Warren of The Politics of Environment in Southeast Asia: resources and resistance, Routledge 1998, and co-author with Derek Hall and Tania Murray Li of Powers of Exclusion: land dilemmas in Southeast Asia, Singapore University Press and Hawaii University Press 2011. 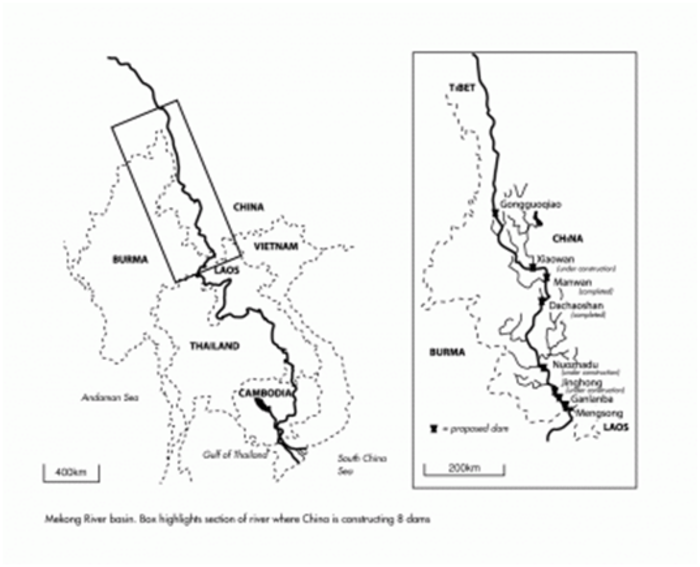 Philip Hirsch, China and the Cascading Geopolitics of Lower Mekong Dams, The Asia-Pacific Journal Vol 9, Issue 20 No 2, May 16, 2011.